← Will education cuts affect Sheffield businesses? 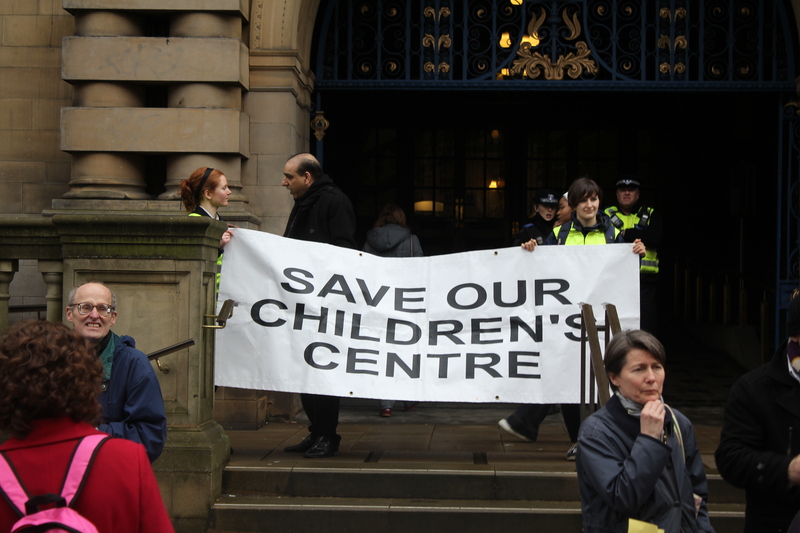 Demonstrators were protesting outside Sheffield City Council earlier this afternoon over proposed budget cuts for local children centres. Sheffield’s Sure Start Children’s Centres are facing an imminent 15% budget cut put forward by Sheffield City Council, as part of the nationwide cuts put in place by the Government. There are over 30 Sure Start Children’s Centres in Sheffield, which provide a variety of services to families within the local community which include family support, antenatal and postnatal health services, stay and play groups and family information and advice. The protestors claim that if the budget cut does go ahead, it will seriously affect the range of activities and services that the centres can provide. Richard Cowton, aged 26, Special needs tutor at the Sharrow Sure Start Children’s Centre and one of the organisers of the protest said “We’ve been in a big meeting today with Colin Ross, the Liberal Democrat and Jackie Drayton who’s on the Labour Shadow Cabinet. Colin Ross and the council officers we’ve met today tried to tell us that the 15% (cut) has to go ahead. The group of demonstrators varied from those who tutor at the centres, to the families who visit them, but all of them were determined and focused to make their voices heard and oppose the cuts the Government wants to put in place, holding various banners and signs with slogans against the cuts, as well as chanting against it. The cut is to be forward on the 4th of March when the Council sets the new financial budget for the year. The campaigners set against it have set up an online petition at https://sheffield.moderngov.co.uk/mgEPetitionDisplay.aspx?ID=60&RPID=21606&HPID=21606 , to try and gather signatures which they hope will persuade the Council to listen their message. Another demonstration has been scheduled for this Saturday 26th February at 10 am to 4 pm, outside Marks and Spencers on Fargate, so if you want to take part in it to voice your disapproval of the centre being shut down, make sure you take part in it. This entry was posted in Events, General news, Politics and tagged Colin Ross, Cuts, Government, Labour, Liberal Democrats, Protest, Richard Cowton, Sheffield City Council, Sure Start. Bookmark the permalink. Q.P.R put the champagne back on ice.